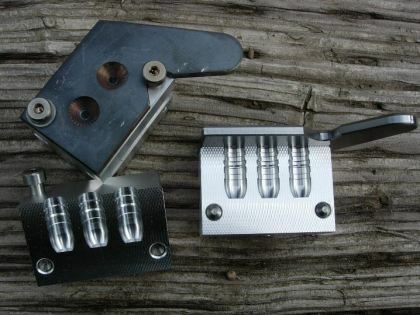 Molds are available in iron, aluminum, and brass. 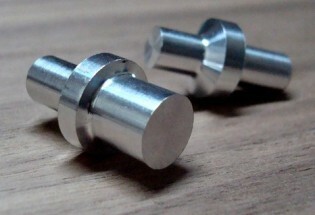 They are CNC lathe bored to any design to your specifications. Multiple cavitity molds can be configured to cast a different design from each cavity. Made to fit RCBS and six cavity Lee handles. Flat-faced top punches work very well for sizing flat-faced bullets. Will fit any RCBS/Lyman style sizer. 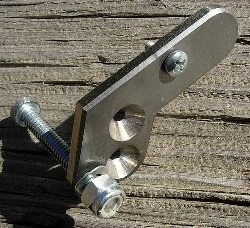 Made of aluminum and available in a variety of sizes. A special sprue plate that attaches to a Magma style casting machine mold. This allows the mold to be used with handles for hand casting. This is NOT needed for regular mold blocks. It's useful only on MAGMA machine molds and only when casting by hand.